As the period 12,275 - 11,862 BCE offers a breadth of time and inarguable correlations to the pyramid, then approximately 2,550 BCE should also offer something deeply comparable considering it is the time period of its 'builder'. To incorporate an overlay upon the pyramid does beg the question of how does it correlate? The time periods are so different that there would have to be identifiable effects from the astronomy upon the architecture. The first image below, of April 16th, 2550 BCE, takes notice of the triple intersection of ecliptic, equator and horizon aligned as previously done, with the Sun at the entrance to the pyramid, but neither Sirius nor Canopus are yet an important part. This moment is a couple of days shy of being an equinox, like all such images presented. 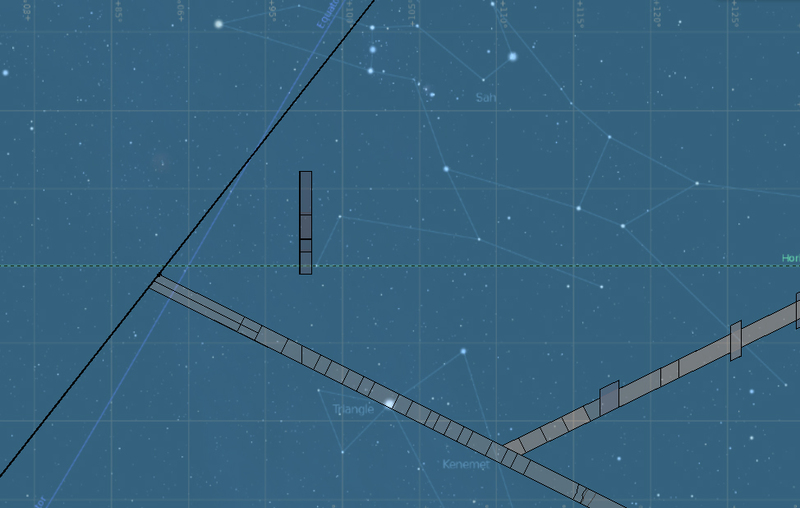 The ascending passage aligns to Betelgeuse and Vega, while the roof of the entrance passage extends out to touch upon Kocab and Pherkad of the constellation Two Poles/Ursa Minor. Fomalhaut is nearly 3 arc-minutes shy of being upon the meridian above the Queen Chamber, while Antares and several other stars of The Prow/Scorpius hover about the horizon. On the right just above the horizon is Arcturus, sitting on the level of the join between the top two courses of the Queen Chamber. The following image has the same date as above but after several hours have passed, and centres around Sirius being upon the meridian which makes various stars take up some curious positions, especially for Canopus. For Khufu's time period, good arguments have been made by researchers into the pyramid that the shafts and passages are aimed at particular parts of the sky with stars passing by, which is certainly a possibility for ritual observation, and actual observation in the case of the entrance passage. For the King Chamber shafts, the south could view any of the belt stars of Orion when those stars pass through the sky in alignment with the shaft, while the north shaft points close to the north circumpolar region. The Queen Chamber shafts could see Sirius in the south and Mizar in the north at certain times, although the angles are close to aiming at the stars rather than exactly at them. Other than these specifics, all four shafts may catch any number of stars that wander past the alignments. From the image above where Sirius resides upon the meridian, the location of Canopus within the passage to the Queen Chamber does offer up a possibility to do with the a specific area within that passage, as seen in the following diagram which shows the layout of the masonry of the passage. The construction of the passage is certainly a purposeful thing and the placement of the seven larger blocks of the wall could indicate an interaction between the positions of Canopus at different dates overlaid upon the pyramid. Certainly there have been intrusive investigations into this area, with two holes drilled into the wall which found that beyond were sand-filled cavities. While it is known that sand has been used in pyramid construction as a slow release product to allow blocks placed above the sand to be lowered into a particular position as the sand escaped, that this kind of technique was employed somehow in this area has not been proved, let alone pinpointed as to which blocks would have been lowered from this set-up. Having these larger blocks within the passage might be indicative of the positions of a star though, and as the focus has turned to Khufu's time-period, speculating about Canopus should be addressed before turning to Sirius. As can be seen in the diagram, the step within the passage stops just after the larger wall blocks, a result of Howard Vyse searching for a possible hidden passage or such beneath the floor. Certainly these blocks are significant, and other than hinting at some chamber or passage behind them, a reference to the stars might be their purpose. Other than these possibilities, they could reference the seven visible astral bodies of our skies: Mercury, Venus, Mars, Jupiter, Saturn, the Moon, and the Sun, and then there would be no observable correlation or alignment for them and they would hold a symbolical association. For the date of the overlay in 2,550 BCE, Canopus is seen to be beneath the central block, some 11” below the floor level there, but certainly above the floor level of the other part of the passage. The action of precession has the stars moving across to the left upon the overlay as time passes by, and this is apparent due to the stars slowly edging higher in relation to the meridian, where Sirius reaches its highest position in 627 CE from its base position in 11,875 BCE. As all the sky rotates in a circular arrangement, the higher the stars appear upon the meridian also has them appearing further to the left in relation to the overlay upon the pyramid. As Canopus can be seen to be beneath the centre block within the passage in 2,550 BCE, in one sense this defines that for Canopus to be in proximity of the blocks at either end of this area means a stretch of years can be offered up for when these moments occur. When measured upon the pyramid, the approximate centre of the block closest to the chamber is 352” from the pyramid's centre axis, equating to approximately 8º 07' 23” to the left of the meridian. The centre of the furthest block is approximately 622” from the axis, equating to approximately 14º 21' 14” to the left. The years that represent Canopus in these alignments are approximately 1,435 BCE and 3,770 BCE. This offers a time span of 2,335 years. To take the approximate positions of the edges of the blocks on the extreme ends has these measurements: 330” - 645”, meaning 7º 36' 55” to 14º 53' 05” to the left of the axis. These define the years 1,270 BCE and 4,012 BCE, offering a span of 2,742 years. The average to both time spans equals 2,538.5, and considering the year 2,550 BCE is being offered for Khufu's time, and that the measurements associated with the blocks themselves are approximations, there does appear to be some relevance to Canopus being used in this area and the blocks themselves representing this, so Khufu's time could be said to have Canopus in alignment with the centre block, and the positions of the seven blocks represent a time span of possibly some importance. In stating this, the identification of the years 4,012 BCE and 1,270 BCE – or their approximations depending upon the exact sizes of the blocks and their end positions – might be historically important and exhibit episodes of significance within the ancient Egyptian civilisation. Accordingly, each block might also represent a significant time-span with transition periods, and Egyptian history might have recorded such periods or, in the least, significant moments at each transition, such as a temple being constructed, or a new capital city being located. To have Canopus in this area at this time certainly means that Sirius is further away, and scrolling through the hours to see where Sirius is when it crosses the horizon line has it in alignment with the upper plug block of the ascending passage. Having any time of the 2,550 BCE year represented in an overlay would show the stars in their pattern so that Sirius would cross the horizon in pretty much the same location – give or take a fraction of an inch – but the Sun would be in a different position that may also have some importance upon the whole. One aspect that does appear to have some relevance is ten days before the winter solstice, when the moment of sunset also has Sirius rising upon the horizon, and the effect of the Sun and astronomy upon the pyramid can be seen in the following image. At this moment there is an effect upon the forms of the ecliptic and equatorial lines, making them intersect upon the edge of the pyramid at approximately 3,317” above the pavement, in the 110th course. For such as this kind of view, the sunset will always show the same kind of intersection of these lines and always in this particular area – give or take a half degree of value due to the Sun having such a range of location over great lengths of time. What does become significant in this view is not just the location of Sirius upon the horizon, but also the positions of several other stars: Algieba in Leo is approximately half a degree above the horizon; and Rigel, Cursa, Arneb and another star in the constellation Sah are in exact vertical alignment with two main stars of the Jaw/Taurus, and this vertical alignment meets the exact location of the north shaft of the King Chamber aligning with the casing of the pyramid. Just below this is Aldebaran, which rests exactly on the 2,888” level. While this astronomical view could be shown for any moment of that year, and the Sun would be at any location but certainly the stars would hold the same pattern as can be seen above, the importance is made due to the sunset moment and the appearance of Sirius. 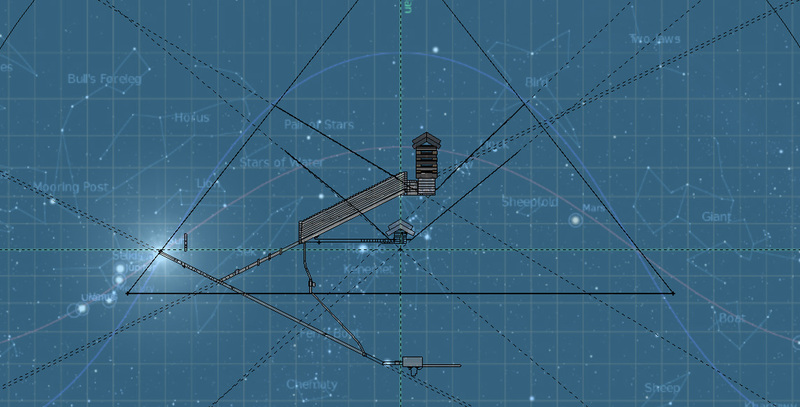 One day before or after would have Sirius either below the horizon at sunset, or already risen at sunset – and hence the complete star field slightly different - so to have this arrangement has the effects extending through to the vertical alignment of stars to the position of the current mouth of the shaft. There are so very few architectural features to the pyramid, and yet the appearance of such as this image offers a hint at the precision and complexity involved in the design of the pyramid, and the astronomical interaction covering vast ages of time, and how by pinpointing specific moments, amazing correlations between overlay and form can be uncovered. It must be mentioned that at one hour before sunset, Sirius will be seen to be upon the floor of the entrance passage, some 970” down from the mouth of the passage. It has already been shown that the moment of one hour before sunset on the winter solstice has the Sun within the space of the intersection of the entrance and ascending passages, so one way of viewing the length of the entrance passage down to this space could see the passing of the Sun through this length at all times between both equinoxes and the solstice. Another way of seeing this length of passage is in relation to Sirius and the vast amount of time that would have Sirius passing through the passage at various points. We know that the blocks within the passage are not identical and there are differing sizes all along it, and like the larger blocks within the passage to the Queen Chamber could reflect the locations of Canopus between the years 1,270 BCE and 4,012 BCE, there may be some significance underlying the sizes of the blocks within the entrance passage in the same way, and once again more than one association if the Sun and Sirius are both being represented when overlay and architecture are being incorporated together: a great time span of years for Sirius with a half year time span for the Sun. As Sirius reaches its highest position in 627 CE, it is simple enough to rotate that time so that the star resides within the entrance passage, and it does so at approximately 750” from the casing, and the block here within the wall is approximately 77” long, the second largest within the passage. The longest block is 82.4”, beginning approximately 332” down the passage, and far outside the touch of Sirius. The following image shows Sirius within the passage in 627 CE, and the vertical alignment of Orion's belt stars are also within this block. If this is the furthest of Sirius' reach within the passage, then from 627 CE towards 11,875 BCE would have Sirius crossing the entrance passage in all parts on all dates, and for a particular stretch of time it would traverse both the entrance and ascending passages. It is worth mentioning that a point measured down the entrance passage to approximately 1,989.6” upon the floor, and a vertical line made from here to the ceiling has Sirius crossing this line in the middle of the passage in 11,875 BCE, and the mathematical association to this is the 12,501 year period divided by the measurement equals approximately 6.2831725, which is a very close figure to 2pi. Considering this, it is possible an exact measurement to Sirius within the passage would identify 2pi. One date that has Sirius moving through both the entrance and ascending passages also identifies several other stars having a visual interaction with different parts of the pyramid, and this is May 18, 6,750 BCE, which can be seen in the following image. It is based upon an equinox with the Sun upon the TI, but due to the exact location of the Sun, it is a little lower than being exact upon the horizon, otherwise the date would be adjusted by one day and the Sun would be just above the horizon for the TI to be observed, such is the slight limitation of the star program. As such, it shows the locations of Sirius, Procyon, Alnitak and Rigel within parts of passages of the pyramid, and considering where Sirius is, if it were placed within the middle of the passage, the extended arm of Sah would align with the edge of the northern wall of the gallery. It should be noted that at this moment, Arcturus is exactly upon the horizon. It can be seen in the image that the horizon crosses through the floor of the ascending passage approximately 118” above the upper girdle blocks, and this location is where Sirius crosses through the passage on this date, appearing upon the horizon at that time. When time is moved forward several hours until Sirius arrives upon the meridian, the star is found to be upon the face of the top step in the Gallery, and just several inches above the floor of the Gallery. 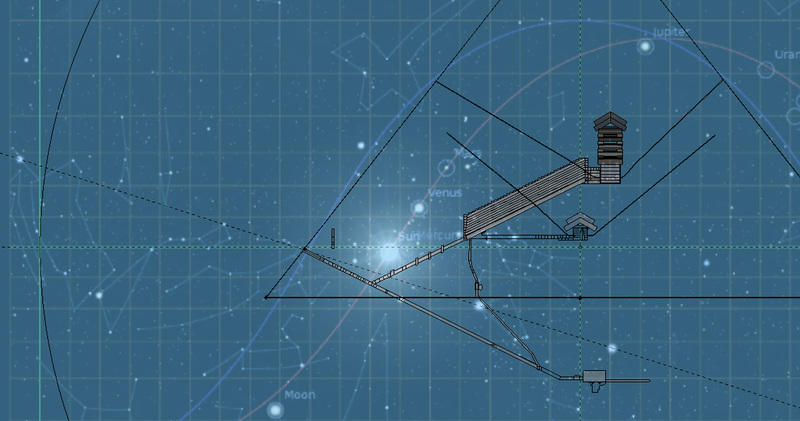 In a further overlay in the next section, this will have an alternate affect upon overlay and architecture. The date of July 2nd, 12,118 BCE was the first one mentioned for identifying astronomical correlations, dependant upon the position of Sirius upon the centreline of the niche in the Queen Chamber, where Sirius would have a longitude of 180º 33' 33”. This date is reliant upon the TI being observed, and while Sirius could have this longitude for all manner of dates, they would occur when the TI was not being observed, but this wouldn't detract from particular dates for overlays if they were important for what the sky was showing. Certainly this era is fundamental in what correlates between star positions and the architecture of the pyramid, and it is worth showing 11,939 BCE near midday. The TI is not observed, having occurred nearly 8 minutes earlier. March 29, 11,939 BCE is two days after the winter solstice. The substance of this came down to the position of Sirius being 179º 33' 32”, with the Sun a little bit before midday, Canopus at 179º 33' 33”, and Vega was at 0º 26' 32”. At some point within this moment of time, a truly stunning sight can be seen: a straight line rising from Canopus, passing up through Sirius then the Sun, and continuing to Vega, as seen from the location of the pyramid when firstly looking south and arcing the view overhead to the north. This straight line can occur at other dates but it will not be seen so vertically, and certainly not when Sirius is in this position. It was mentioned early in the analysis when the first dates were being sought as potentials for an overlay, that 12,020 BCE had a similar observation for Sirius, and it was proposed because it sat upon the centre axis within the niche of the Queen Chamber while the pyramid was reversed, having the entrance on the right rather than the left. It was also proposed that this arrangement did not for the most part suit the main investigation because as time passed by, the stars of the sky precessed to the left rather than the right. This is not to say that having a reversed orientation of the pyramid does not offer up an exacting interaction between sky and architecture, as it is certainly an impressive observation occurring in 11,939 BCE. The following image is this moment as overlay upon the pyramid. 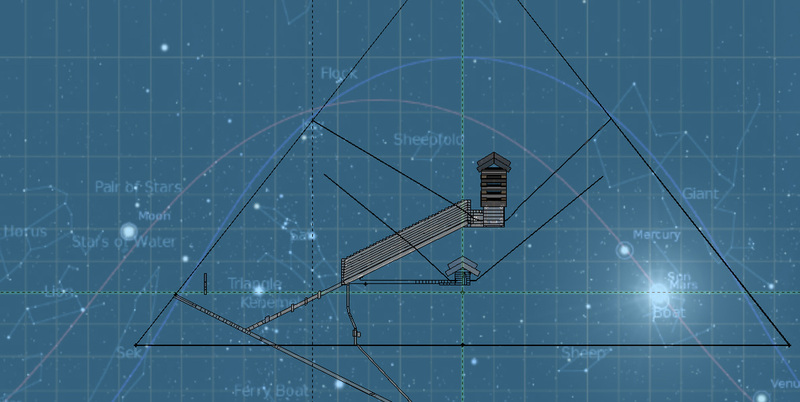 What can be seen is Sirius in the niche and exactly upon the floor level; Canopus and the Sun aligned with Sirius, with Canopus between the Subterranean Chamber and the small chamber just outside that; and Vega slightly right of the northern meridian on the left side. Having any other year or day places the alignment off kilter when compared to this, for while Sirius can be found at the same longitudinal position, Canopus and Vega do not hold these same positions, so a perfectly vertical straight line is not obtained but rather is slightly angled. The dark line cutting across the centre of the image identifies the exact horizontal level of Vega and Arcturus, and this line passes exactly through the centre of the hollows in the wainscot of the Antechamber. 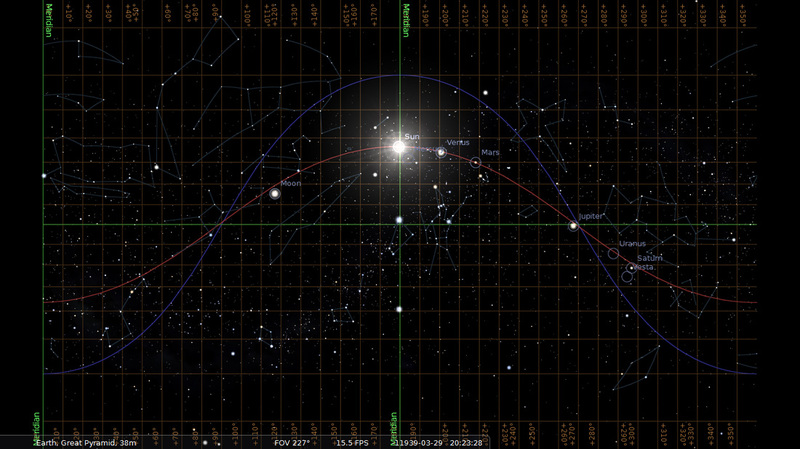 In reversing the viewing direction so the entrance is on the left, an overlay of the same date can be placed which also offers a particular arrangement concerning an alignment of Sirius, Canopus and Vega, but this time including a few other important stars, as can be seen in the next image just before dawn. The dashed line shows an amazing alignment because of the angle of approximately 17.66º that passes nearly through the centre of the entrance to the pyramid. This alignment starts with Canopus then through Sirius and the entrance before taking in Dubhe, Thuban and another pointer-star of the Two Poles/Draco constellation, and ends upon Vega. It is beyond coincidence for such as this. It can also be seen that Alnilam and Rigel are within the passage to the Queen Chamber, and Procyon is within the entrance passage at the point it passes through the pavement level, at the exact spot of the rock-filled fissure at some 1,560” down the passage. In identifying the angle of 17.66º, one interesting fact should be noted which has a surprising correlation. When the fraction to identify pi is more exacting than 22/7, the better number to use is 21.991148575. In laying out a triangle with this better number as the base side and 7 as the rise, the angle of the hypotenuse is approximately 17.657º. It can be recalled that the midday image of this date was viable as the basis for the analysis because of the vertical alignment of Canopus, Sirius, the Sun, and Vega being upon the centre of the niche when the orientation of the pyramid had the entrance on the right, but even having the entrance on the left, the overlay of such a timely moment being shown has its own level or layer of importance. Sirius resting upon the meridian as Canopus rests upon the horizon in 3,411 BCE, and this occurs after Sirius has risen upon the horizon in the location of the winter solstice sunrise. Several further moments in time that do have somewhat unique astronomical observations can be identified. On June 3rd, 8,725 BCE, the stellar field observes several arrangements of particular stars that satisfies an excellent overlay upon the architecture, as seen in the following image. Regulus and Chertan of Leo reside flat upon the horizon at dawn on this equinox, with the Sun resting upon the ecliptic as it arcs just in front of Leo's chest; Sirius rests within a particular section of the well-shaft between gallery and pavement-level; Rigel rests within the centre of the first large block in the Queen Chamber passage; Aldebaran rests within the north shaft of the King Chamber; the centre of Pleiades is upon the southern meridian; Altair and Arcturus are above the horizon and at the exact level of the top of the niche in the Queen Chamber; and Capella rests upon the north-side casing. 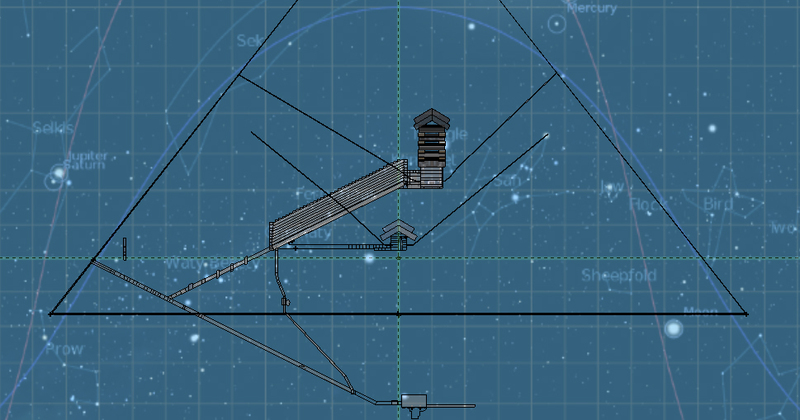 For a moment like this to be an example arises simply by sifting through time in Stellarium and focusing upon either a particular star or alignment of stars, and while all manner of dates can be identified and there can certainly be arrangements that can align to particulars of the pyramid, it is the fact of these alignments that strengthens the interaction between the flat mapping of the cosmos upon the pyramid. 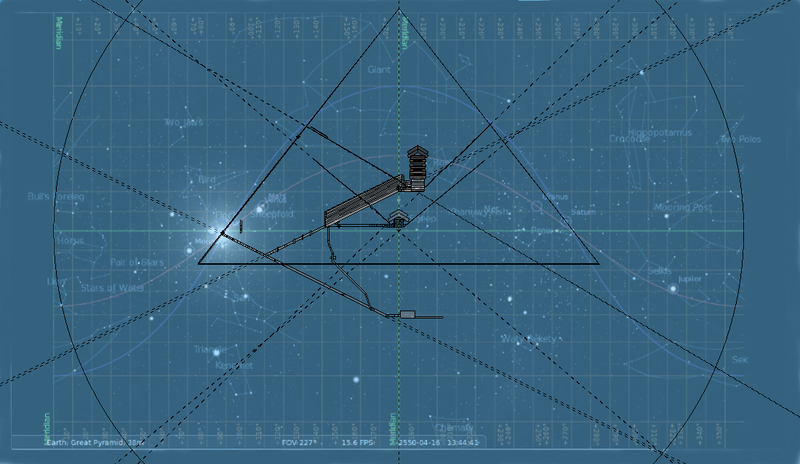 It is beyond our ability to particularly identify if something of importance occurred on a particular date in history that warranted a record to be made of its occasion, pin-pointed through an exact recording of the astronomical arrangement, but to see correlations between star positions and architectural arrangement does continue proving an overall plan mirroring the sky into the pyramid. On June 5th, 4,056 BCE, a double star-rise occurs when Sirius and Regulus appear at the same time upon the horizon. One aspect that could be included is Regulus rising in the location of the summer solstice dawn in 3,627 BCE or there-about, and other years could also show stars rising in this position. In 4,056 BCE, after Sirius and Regulus have risen together, the time turns through the sky and the moment occurs when Betelgeuse passes through the location of the niche at the end of the Queen Chamber north shaft; continuing onwards until Canopus appears on the horizon, Betelgeuse holds a position that as overlay places it just before the niche at the end of the Queen Chamber south shaft. 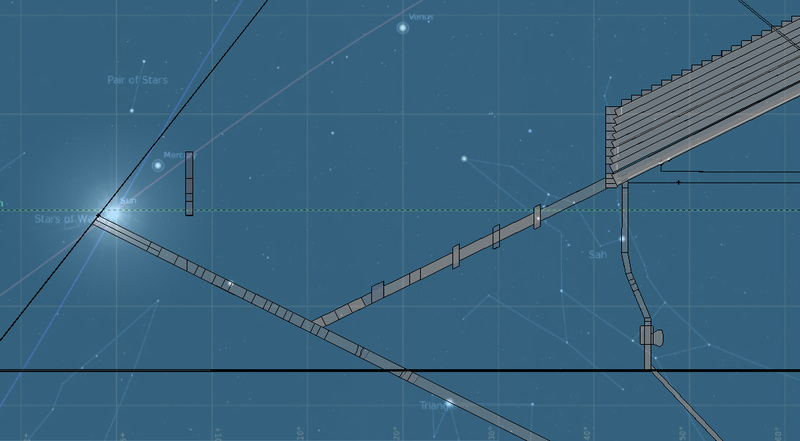 Canopus can be seen to be aligned with the join between the last two large blocks in the Queen Chamber passage, while Sirius is on the third level of blocks in the relieving chambers and hiding in the south wall. For Sirius, this level equates to a centre point upon the axis of the pyramid that sees a circle of radius 2,206.92754” reaching both the pavement level and the casing. In defining the exactness of the construction that exists instead of the perfect measurements used in the model, it can be assumed that the pyramid does hold a shape whereby the true centre point for a circle that reaches both the pavement level and the casing is approximately 2,207.002817” above the pavement, so the boundary is this radius. By stating this measurement, a further allusion to pi is asserted, in the same fashion as was previously mentioned concerning the actual number divided by 7 that equates to pi. In using 22 as the denominator, the numerator is approximately 7.0028175. Once again it has to be purpose involved instead of coincidence, seen in 22 + 7.0028175 being found as a specific association with the construction and the astronomy and pi. One thing we do know is that Sirius is above the horizon line in its lowest position of transverse of the sky, or approximately 105” above. We know that Sirius is upon the floor of the chamber, exactly upon the centre of the niche, in 12,118 BCE when the TI is observed, while its nadir is in 11,875 BCE where it crosses the meridian some 2.5” below the floor level, and when aligned to the centre of the niche, is some 2.65” below the floor level. With the horizon upon the main level, Sirius reaches the top of the niche in 9,715 BCE, and taking this from its nadir-moment means a time span of 2,160 years to rise through the height of the niche. This span is familiar, being a twelfth of a Precessional cycle of 25,920 years. With a better cycle of 25,772 years, the span would equate to about 2,147 .66 years, and keeping the top of the niche solid, hence 9,715 BCE solid, we find 11,862.66 BCE as the start point for this twelfth-cycle. We know this year date defines one side of the size of the Queen Chamber, and now we can be sure the height of the niche is an aid in representing the Equinoctial Precession Cycle in the range of years that it is accepted as occurring in. One further date to include is 10,794 BCE, with the usual location of the Sun in the entrance passage a couple of days before the equinox. The following overlay is focused upon Betelgeuse being upon the meridian, which finds it at the base of the top step where it meets the floor of the gallery, and it can be seen that several stars take up interesting positions. This overlay occurs when the TI is observed. By adjusting the year-date, it is possible to have Betelgeuse upon the meridian while Aldebaran, Ain and the Pleiades are within the ascending passage projection, occurring in 10,970 BCE. This period would still see Sirius very much beneath the middle of the first large block in the Queen Chamber passage, while Canopus is within the Subterranean Passage, about half way along to the niche. There can be quite a few associations of stars in specific locations upon the horizon like these but the years they are in really don't offer anything substantial towards any kind of confirmation like the main ones mentioned, as we cannot be sure if they had any particular relevance that were meaningful in being observed. Certainly we can be sure of the cycle of extreme positions of Sirius, and the period of time for Khufu, but all other overlays would just show correlations between star locations and features of the pyramid. For Canopus in alignment with the central large block within the passage to the Queen Chamber, even this can only be speculated upon as having a correlation, although the blocks might just as well reference Sirius around 11,000 BCE as crossing those areas.